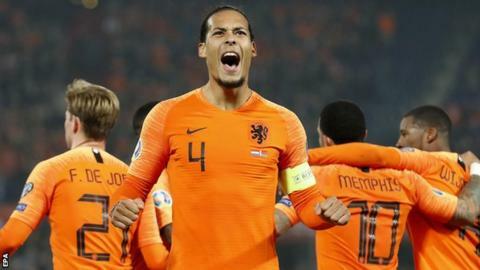 Ronald Koeman's side, who face England in the Nations League semi-finals in June, host Germany in an eagerly anticipated clash on Sunday. Northern Ireland defeated Estonia 2-0 in Thursday's other Group C qualifier. Attempt missed. Anton Saroka (Belarus) header from the centre of the box is close, but misses to the left. Assisted by Igor Shitov. Attempt saved. Memphis Depay (Netherlands) right footed shot from the right side of the box is saved in the top centre of the goal. Assisted by Steven Bergwijn.